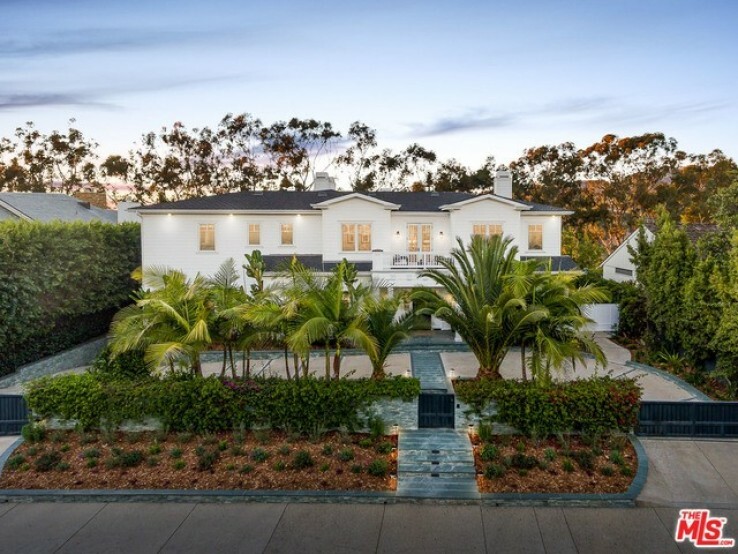 A gracious traditional, 749 Amalfi Drive, is located on the rim side of one of the most desirable streets in the Palisades Riviera. Tastefully done and filled with charm this beauty fulfills all the needs of modern day living. The family room and chef's kitchen serve as the heart of the home with a fireplace, large marble island, high end appliances, dining area and butler's pantry. The main level includes a grand 2-story entry, office, lovely living and dining rooms and guest suite overlooking the pool. There are 6 bedrooms and 9 bathrooms. The spacious master with fireplace, balcony, sitting room, 2 walk-ins and fabulous bath is located upstairs along with 3 additional en suite bedrooms. Several sets of French doors open to a lush and extremely private rear garden with rolling lawn, mature trees, pool/spa, and breathtaking views creating a seamless interplay between the indoors and outside. The lower level has a screening room, bed, bath, powder and very impressive 8 car garage.